Italian Alessandro Ballan has taken a strong solo win in the World Championships road-race. Italy scopped the top two places, with Ballan?s team-mate Damiano Cunego taking silver behind the former Flanders winner. After a very indecisive race, Ballan broke away from a group of twelve around three kilometres from the line. His attack was so powerful he could even sit up and celebrate in the final 200 metres. Cunego was the fastest in the chase group, taking silver, with Dane Matti Breschel taking bronze. 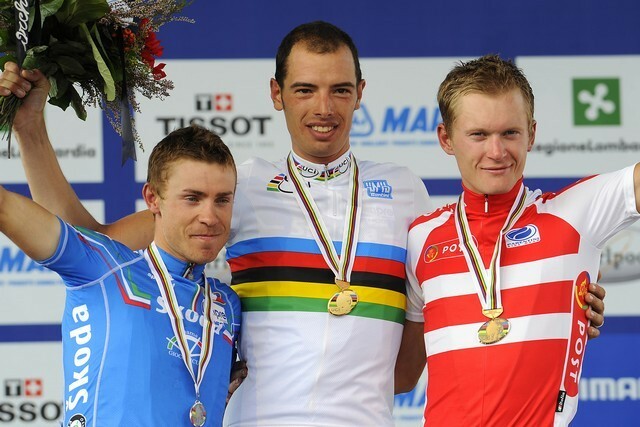 Ballan?s gold means Italy have now taken the men?s road-race for the last three years in a row. Paolo Bettini, riding his last race after clinching the rainbow jersey in 2006 and 2007, finished in the main bunch waving his arms to celebrate his team-mate?s victory. As happens so frequently in World Championships road-races, the winning move only formed in the last lap. Bettini and arch-rival Alejandro Valverde (Spain) had tried one big move with around 80 kilometres to go, but it was too early to stay away. There then followed a long period of tedious stalemate, broken only by the odd acceleration by Spanish or Italian riders. It certainly lacked the sizzle of the the men?s U-23 event or the women?s road-race. After a loosely-formed group of around 12 had formed close to the end of the second last lap, on the final assault of the Ronchi climb, Robert Gesink of Holland forged the decisive move. With him went no less than three Italians – Cunego, Ballan, Rebellin – as well as Spanish dangerman Joaquim Rodriguez and the ever active Breschel and Chris Anker Sorensen of Denmark. After a double charge by Rebellin shattered that group, Ballan blasted away with an amazingly strong downhill attack. Egged on by the home crowd the 2007 Flanders winner opened a gap of around 12 seconds – and that, essentially, was that. If Italy were understandably ecstatic at taking the two top spots on the podium, the big losers on the day were the Belgians and the Spanish. Neither of the two other top-flight squads expected to influence the race really had much of an impact, leaving the door open for the Italians to take both top medals, three places out of the top four, and their third straight World Championships victory. It was also their first win in a World Championships on home soil in 40 years.